There are some 22.4 million homes in England, housing 52 million people. They range from the smallest studio flat to the largest palace, and vary in age from medieval castles built of local stone to new homes designed to the most exacting sustainability standards. Numerous books have been written on English housing – particularly those buildings of architectural interest. 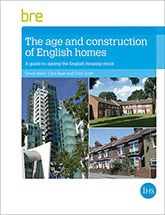 This guide is unique in that it provides detailed information on typical designs and features of houses built at different periods, using statistics from the 2010 English Housing Survey. The report includes details on building materials and building elements typical of different periods, and a glossary of architectural terms used in the publication. Experienced surveyors and housing professionals will have developed an intuitive feel for when a house was constructed and the date of any modifications which have been undertaken – particularly in their own local area, where they are familiar with local materials and designs. As such, this book is intended for less experienced professionals, students of housing, or individuals with a personal interest, to be taken onto the streets and used as a reference book. FB71, tenure, England, housing, homes, houses, history, architecture, design, age, building materials, roofs, walls, windows.